A small air leak has been detected on board the International Space Station. Update for 5:45 p.m. EDT: Astronauts are fixing the small air leak on the International Space Station. See their progress here. To find out more on a potential cause of the leak, read this micrometeoroid report. Astronauts at the International Space Station are working to repair a small leak that was discovered at the orbiting laboratory Wednesday night (Aug. 29). While the leak caused a slight drop in cabin pressure, it did not pose an immediate danger to the astronauts currently living aboard the station, NASA officials said. Flight controllers on Earth began to notice changes in cabin pressure around 7 p.m. EDT (2300 GMT), while the six crewmembers of Expedition 56 were sleeping, NASA officials said in a statement today (Aug. 30). They determined that the leak is in the Soyuz MS-09 spacecraft, which is docked at the Rassvet module on the Russian segment of the space station, Dmitry Rogozin, director general of Russia’s space agency Roscosmos, told Sputnik News. Rogozin told the Russian news agency that the crewmembers found a microfracture that may have been created by a micrometeoroid impact. "The leak has been isolated to a hole about two millimeters in diameter in the orbital compartment, or upper section, of the Soyuz MS-09 spacecraft," NASA officials said in a subsequent statement about the status of the repair work. "The rate of the leak was slowed this morning through the temporary application of Kapton tape at the leak site. Flight controllers are working with the crew to develop a more comprehensive long-term repair." The Soyuz MS-09 spacecraft launched to the space station in June with Expedition 56/57 crewmembers Serena Auñón-Chancellor of NASA, Russian cosmonaut Sergey Prokopyev and ESA astronaut Alexander Gerst. It is scheduled to return to Earth in December with the same three-person crew on board. "The ship will be saved with the use of the repair kit," Rogozin told Sputnik News. "The crew are healthy and safe with weeks of air left in the International Space Station reserves," ESA officials said in their statement. Additional updates will be posted on NASA's International Space Station blog as more information becomes available, NASA spokesperson Dan Huot told Space.com in an email. 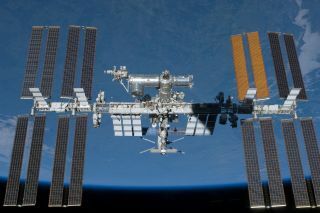 This is not the first time a small leak has sprung up on the space station, which has been continuously inhabited by rotating crews since 2000. Another leak occurred in the station's Harmony module (which is located on the U.S. segment) in 2007 during Expedition 16. NASA officials said at the time that this leak was no cause for concern. The station's current Expedition 56 crew includes NASA astronuats Drew Feustel, Serena Auñón-Chancellor and Ricky Arnold; Russian cosmonauts Oleg Artemyev and Sergei Prokopyev; and German astronaut Alexander Gerst, of the European Space Agency. Feustel commands the crew. Editor's Note: This article has been updated with new details about the location and cause of the leak.